Well… they showed up with the rental car this morning without warning. We decided to decline the car and instead had a slow breakfast on the patio and then did some swimming and lounging by the pool. The view from the pool is a pretty amazing one, so we felt we got to see all we really needed to see today. In the early afternoon, we walked over to see the view from the ruins of a Venetian castle, and then we made our way down the many (200-plus) and winding stairs to Ammoudi, a tiny port situated just below our hotel. Upon the recommendation of Traditional Home magazine (who conveniently did a feature on Oia in their June 2015 issue), we ate lunch at Katina’s right on the water. After a leisurely lunch, we walked over to a swimming and cliff-diving spot. The walk over was a bit more challenging than I expected, and I was glad I had packed my flip-flops in the backpack instead of wearing them over. There was also a narrow bridge that might have made me just a little nervous! Once we got to the spot, we found a bit of a crowd. There is no beach area, so everyone had their things spread out on the rocks. There was a small jumping platform just off this area; the larger and higher jumping spot was a swim away. I told Tim he could go first from the small platform, and I would stay with our things, then we would switch. Tim took the jump, and came up with a few cuts on his feet to attest to his declaration that the rocks were sharp. Not being one to enjoy any type of pain, I declined my turn. I told Tim that I would be fine waiting for him if he’d like to swim over to the higher platform, but he decided that was not advisable since he didn’t have shoes he could wear. Many of the people we watched scrambling up the rocks at the high platform and jumping off were wearing tennis shoes. Tim decided lacerated feet weren’t worth the adrenaline surge. I offered him my flip flops, but he decided those probably wouldn’t do much to help him. 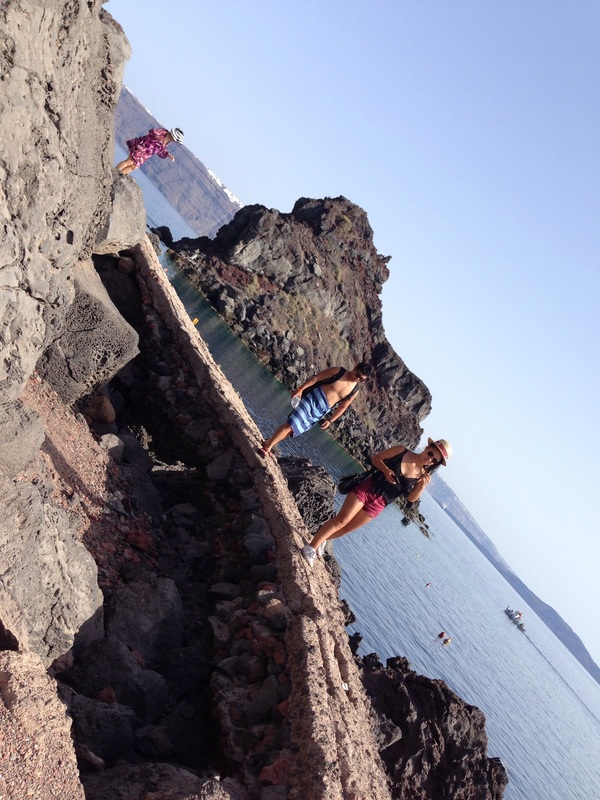 🙂 So it was a quick trip to the swimming spot, back across the narrow rock bridge, and back down and over fallen rocks to get to the stairs back up to Oia. After sunset, we wandered around town and looked for any last minute things we just had to buy, had a gelato dinner, and went back to the hotel to begin packing. 10 years of dreaming and talking about coming to Greece, and now it’s come and gone. Even with some of the little bumps, it really has been a dream come true. Our time together in this country, Tim’s declared “most beautiful place in the world,” has been really wonderful. We saw so much, learned so much, experienced so much. 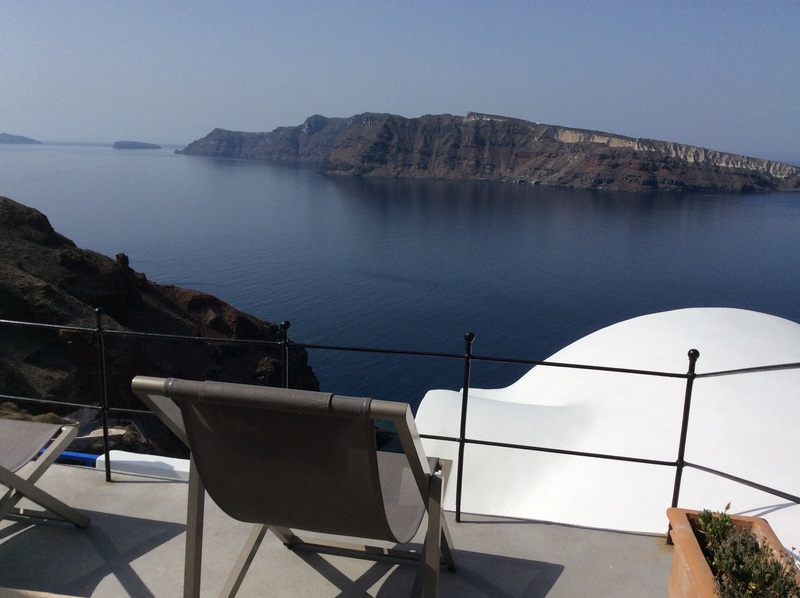 It’s hard to believe we just barely touched the surface of what Greece has to offer. We’ve talked about coming back again one day and experiencing more of the beauty and diversity the country has to offer. But for now, it’s off to Turkey. Yassou, Greece! As they say parting is such sweet sorrow. Off to Turkey. I hear they have good turkey sandwiches. Pray the rest of your travels is just as wonderful! You are blessed beyond measure!!! What a grand experience! !